So many of the artifacts in the suitcase are so random, I am going to have to do some deep digging to shed some light on them. I’ve posted some of these in the Artifact Library, but as I get more inform on them, I’ll be sharing my updates here. What prompts someone to copy down song lyrics? During my research, I remembered my own reasons. 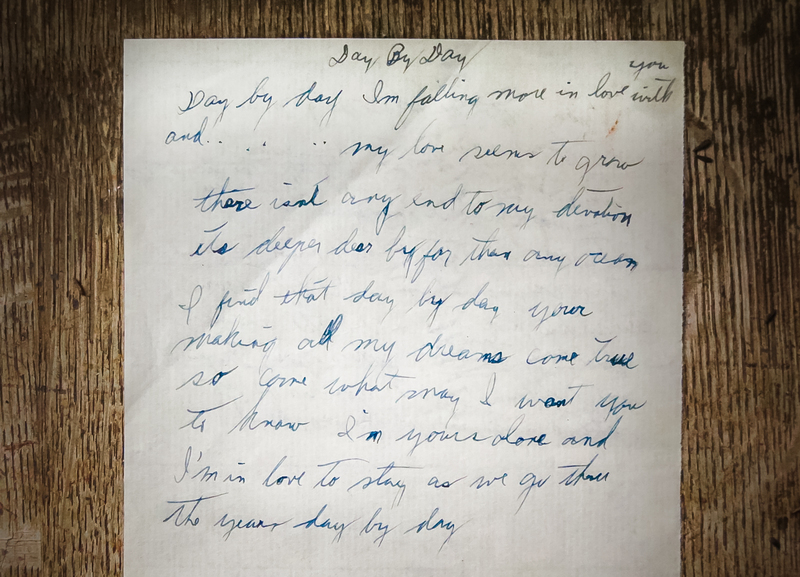 “Day by Day” was written in 1945 by Paul Weston and Axel Stordahl with lyrics by Sammy Cahn. It was first recorded by Frank Sinatra with Axel Stordahl & His Orchestra (August 22, 1945). I’m a nut for this genre of music, so I was momentarily caught up in the backstory of Sammy Cahn. While you may not recognize his name, you probably know all the words to the majority of his songs…they are almost part of the human genome at this point. We weren’t completely different, she and I. I too can spend hours in an antique mall, as long as it is the jumbled kind, full of random stalls ranging from prim doilies displayed on elegant sideboards to towering stacks of milk crates full of random junk. Mildew, dust and the smell of long-ago fills the nose. It’s a smell that can automatically identify a place, as fresh cut lumber identifies the hardware store and leftover grease and cigarette smoke marked our favorite bar. The fifth store of the day was one of the higgledy-piggledy ones, and I happily escaped from the group and headed into the maze of stalls. I was going through a pottery-barn/shabby chic phase (I know, don’t judge) so when I saw a small, brown suitcase that would fit exactly under our side table, I snagged it. I popped the latches and opened the lid. Inside the purple silk-lined case were stacks of paper. Shuffling them around, I found a pile of black and white photos and some hand-written letters. Underneath a brittle paper map of Paris were scores of film negatives. Holding a negative against the fluorescent light that buzzed overhead, I saw a man wearing a military uniform posing in the shadow of the Eiffel Tower. As I continued to dig through the contents, I couldn’t believe no one had been bothered to go through them…if only to sell the individual pieces. It’s common for antique stalls to have a basket of old photos and postcards, priced at a couple of dollars a piece. I always poke through these, but can never bring myself to pay top dollar for family portraits, no matter how delightful and candid they are. The more I dug, I suspected I had the remains of someone’s life in my hands. I was eager to start piecing it all together. Like snuggling down with a new book, you could end up anywhere. The paper tag attached to the handle of the case told me this life could be passed into my safe-keeping for $10. I snapped the latches shut and carried the case back to the family unit. As I walked, the contents shifted, and the weight of the person inside pulled at my shoulder. The typically British guilt over even the slightest of windfalls had my stomach in small knots. Slick-palmed and trying to keep my grip on the smooth handle of the case, I approached the cashier. I was going to my doom. I envisioned her popping the latches, raising the lid and slowly turning the case around to face us. Presenting the evidence, my downfall, with a raised eyebrow. “Ello ‘ello…what do we have here, then?” My pious in-laws; smug witnesses to their heathen daughter-in-law, shaking their heads as I was led away in cuffs. The crime: Stuffing a $10 suitcase full of $100 worth of over-priced antique mall ephemera. On the offensive, I opened the case on the counter before the cashier had a chance to do it herself. “All this was in the case…” I started. The suitcase stayed on my lap all the way home. I didn’t want to open it again in front of my family. I didn’t trust them. They wouldn’t understand why I would be so excited about sifting through a stranger’s old papers. I also wanted to keep the mystery a little longer, scared if I took a second look I’d discover it was just a mishmash of un-related crumbling papers..not a mystery at all. I kept thinking of that ‘deep-breath’ moment right before you crack open a new novel. Turning the first page is an exciting prospect: you may soon be off on an adventure..or you might just have a dud. I didn’t want anyone around when I realized I had bought a dud. Later that night, I took inventory. The same man appeared in the majority of the photos. The same name was on several papers. Every thing seemed to be connected but the pieces were also wonderfully obscure and random. I must admit, I gloated a bit. That evening, I got as far as sliding each item into it’s own protective sheet, trashing an entire semester’s worth of theater history notes and carefully inserting the clear sleeves into an old 2″ UNCG binder. The suitcase went under our side table. It fit perfectly, just as I’d thought it would. Over the next couple of weeks, I would flip through the binder, hold each negative up to the light and re-read the anonymous letters again and again. I would unfold the map of Paris and study the numbers that had been written on the map in colored pencil, struggle to re-fold it properly without tearing the weak folds and slip it back into it’s page protector. It’s been 10 years. I no longer have in-laws. The suitcase and I have lived in 5 different houses. Now the case resides in the downstairs bath, filled with medical supplies you don’t usually keep out: bottles of hydrogen peroxide, wart-remover cream and a portable heart-rate monitor. The binder has always sat on a shelf in my various home offices/craft rooms. It was occasionally flipped through, though never shared with anyone. It’s finally time to sit down and turn the first page. I don’t know where this story will take me, but I hope to learn something new. 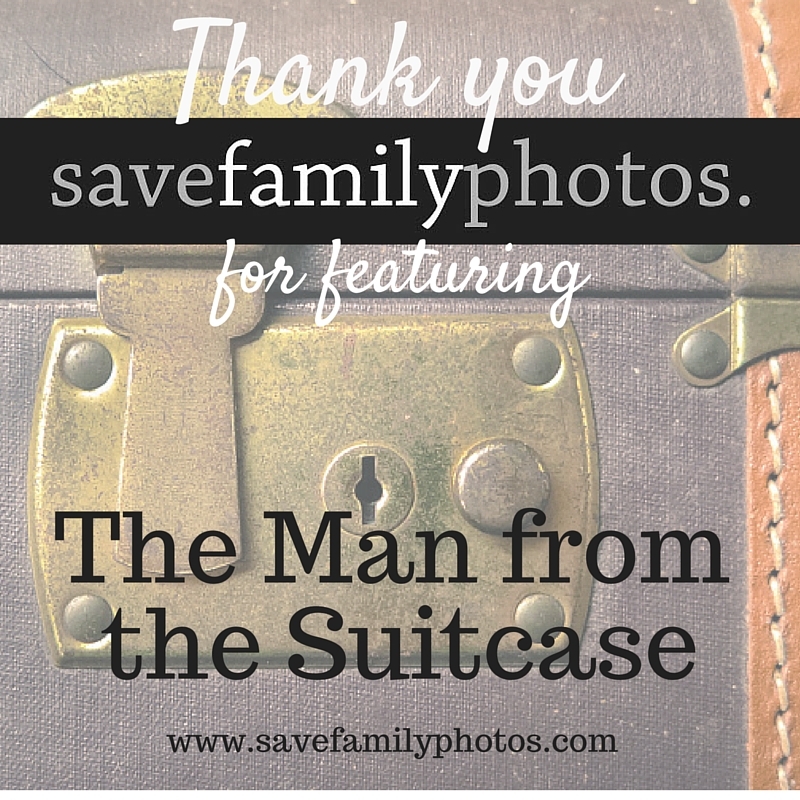 I hope that the man from the suitcase has some living family members that would want to be re-united with Grandpa John’s photos and letters. I’m done hoarding his life. Want to come along?